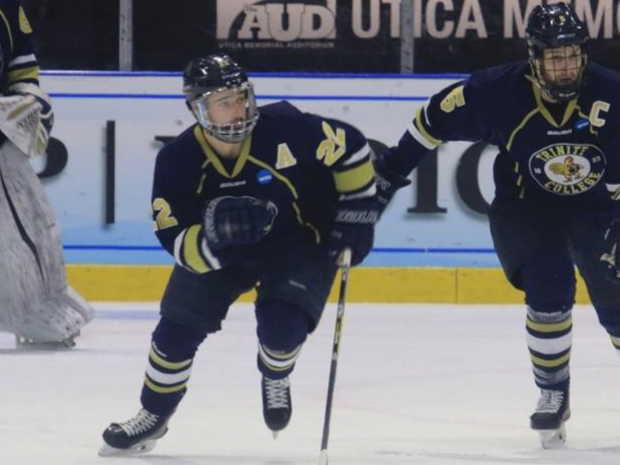 After a stellar win against Endicott in the NCAA quarterfinals, the Bantams traveled to Utica, NY for the Frozen Four. Thanks to outstanding offense, and stout goaltending from Alex Morin ’18, Trinity defeated the St. Norbert Green Knights in the semifinal. In the championship contest, Trinity couldn’t establish a rhythm and eventually fell to the Norwich Cadets. On Friday afternoon, Trinity squared off against St. Norbert (Wisconsin) for a chance to advance to the national championship game. In the first frame, both teams came out flying and totaled 15 shots in the first ten minutes. The Green Knights would score the first goal at the 13-minute mark. Just a minute later, on the power play, Trinity scored the equalizer. Forward Tyler Whitney ’18 corralled the puck at the point and hit line mate Ryan Cole ’17 in the slot, who slid a back door pass to Anthony Sabitsky ’18 for the goal. Trinity got to work quickly in the second period. Whitney rushed the puck up the left wing, beating the St. Norbert defenseman wide heading into the zone. At the hash, Whitney stopped, pivoted, and rifled a pass through a tight window to Ethan Holdaway ’17 on the far post, who banged it home for the go-ahead-goal. Trinity held its lead for a while, but took a penalty at 8:13. The Green Knights took advantage on the power play, when Pijus Rulevicius wrapped around the net and roofed a wrist shot past Morin for the equalizer. After taking two consecutive penalties, the St. Norbert penalty kill held strong, staving off several Trinity chances. With just over a minute remaining in the second period, Trinity captain Sam Johnson ’17 came through. Whitney hit Johnson skating in from the point, who one-timed a slap shot past the St. Norbert tender’s blocker. Johnson’s first goal of the season couldn’t have come at a better time, and would be the eventual game winner. Morin stood tall in net for the rest of the game, turning away several late efforts by the Green Knights, sending Trinity to the final. In the championship, Trinity faced the Norwich Cadets, who reached the final via an overtime win over Adrian College the night before. The first period was evenly played in a back and forth fashion. Trinity had a slight shot advantage (12-11), but the period ended scoreless. The Bantams came out flying in the second period, but Cadet goaltender Ty Reichenbach turned away several scoring opportunities. Norwich drew first blood, when Nick Pichette slid a pass across the crease to Anthony Flaherty, who put it past Morin. A few minutes later, Trinity went on the power play and scored the tying goal. Liam Feeney ’20 fired a slap pass toward the net, and Whitney made a beautiful tip, sending the puck past Reichenbach’s glove into the top corner. Unfortunately, the Cadets would answer quickly, when freshman Todd Jackson showcased his dangerous speed, blowing by Feeney and firing a snipe past Morin on the short side. The period ended with Norwich leading 2-1. Trinity’s Barclay Gammill ’20 almost scored the tying goal early in the third, but Reichenbach shut the door. 6:19 into the period, Norwich took a 3-1 lead, off a wraparound goal by senior Paul Russell. The Bantams had several chances to get one back, including a shot from Andy Chugg ’19 that wrung off the crossbar, and a near goal by Ryan Cole. Late in the period, Reichenbach made a great save off a shot from junior defenseman Griffyn Martin ’18. As time wound down, Norwich scored an empty netter to seal the deal. Despite a crushing loss in the national championship game, Trinity, lead by a historically talented senior class had a phenomenal season. Coach Matt Greason was very proud of this group, and described the class as “the greatest in program history, both in terms of what they accomplished on the ice and as human beings.” The Bantams are runners up in Divison III, and have a lot to be proud of.